A new study has confirmed that polar bears are indeed starving and suggests the species could face extinction much faster than previously anticipated. Researchers participating in the study attached collars to nine bears and recorded their activity levels for almost two weeks. The results confirmed what is already known, the species is suffering from extreme food shortages that are the product of climate change which has caused the Arctic sea ice to melt. 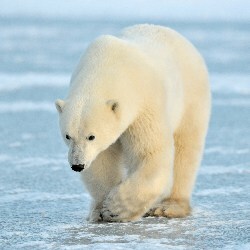 This means polar bears are forced to travel further and expend more energy to hunt. The study was conducted over a three-year period by researchers from the US Geological Survey and University of California, Santa Cruz. The results indicated that polar bears are moving 1.6 times more than what was found by previous studies. The increased activity caused by the search for food means they have larger calorie deficits. The report makes the depressing finding that if climate change continues, the species will struggle to survive. According to the study an adult polar bear requires 12,325 calories per day to maintain its energy level which is the equivalent of one ringed seal every 10 days. Over the time period when the collars were attached to the polar bears, all nine bears were unable to consume their calorie requirement and lost a combined mass of 20 kilograms. Another way to put the situation is that polar bears are now living under conditions of famine. WWF estimates that polar bears spend more than half their time hunting and are only successful less than 2 per cent of that time. The US Fish and Wildlife Service classifies polar bears as an endangered species and the protection program repeatedly highlights the role climate change plays. Experts say unless the problem of a warming Arctic can be mitigated the long-term fate of the polar bear is far from certain. Arctic sea ice measured at the end of last year was recorded at its lowest level since 1979 according to data from the United States National Snow & Ice Data Center. Researchers estimate that the polar bear population has fallen by as much as 40% over the last ten years, however researchers add that it is difficult to study the behaviour of the species in such harsh environments. There is now technology that allows researchers to learn how polar bears move on the ice, monitor their activity patterns and estimate their energy needs. This means we can better understand the implications of changes that are happening to the Arctic sea ice.